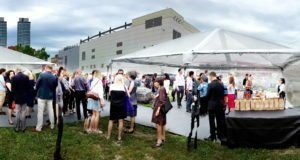 There was a packed agenda for the June 19 meeting of the broad coalition of local groups—including representatives from Corktown, Gooderham and Worts, the Distillery District and several other residents’ and social groups—that constitute the West Don Lands Committee (or WDLC) which is currently co-chaired by John Wilson and Cindy Wilkey. Taking top billings for the night: three key items that dealt each in their own way with the continual transformation of the area as both a place to reside as well as a destination place. 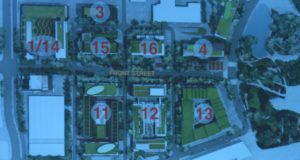 The first item was the reveal for Block 12 of the Dundee Kilmer’s 35-acre precinct plan that is Toronto’s Canary District. 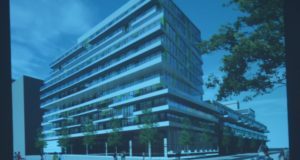 The residential inheritance of the Pam Am games—and today an airy, beautifully landscaped, modern precinct were where one can live, work, play, shop and enjoy Toronto’s newest Y—Block 12 represents the next step towards the area’s completion. Representing the development: architectsAlliance’s Adam Feldman, and Edward Yu as well as Marc Baronette and Michelle Ackerman of Dundee Kilmer, the developer. Throughout Feldman’s presentation, one could see that Block 12 presented no unexpected surprises—no nasty shade-casting towers, but a “block” that easily, artfully, and intelligently fell into line with the kind of built form that has made this precinct the epitome of good neighbourhood planning. The heights of the three key condo towers (twelve storeys on Front St. E. including 13,000 sq. ft of street level retail, stepping back to eight storeys on Mill St., with an eight-storey tower in between) were polite in that they were in keeping with current development standards for the area. As for density, at the current time (and subject to revision), 400 units are planned with 8% being three-bedroom, 48% two-bedroom, with smaller units (one bedroom plus den and one bedroom) making up the remainder. A central courtyard would create a communal open-air space. To complete the block a collection of 43 townhomes are planned along Rolling Mills Road, Mill St. and Tannery Rd. Throughout his presentation, Feldman emphasized the importance of maintaining a “human” scale and how the development would be designed through color or landscaping to “touch” the street. The townhomes, for instance, might have stoops and small front yards that would inform the idea of personal space. 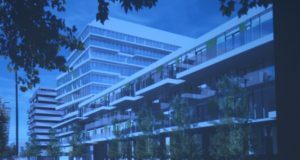 As for the time frame: those interested in living in one of Toronto’s most remarkable new “city within a city” neighbourhoods should look for early fall for sales to begin. An early rendering of townhomes that will line 3 of the District’s streets. 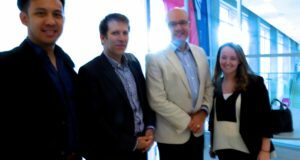 From Left to Right: architectAlliances’ Edward Yu, Adam Feldman and Dundee Kilmer Development’s Marc Baronette and Michelle Ackerman. Initial rendering of Block 12’s Front ‘s frontage with retail. Presenting the second transformation of the night was Anjuli Solanki of the Steps Initiative. 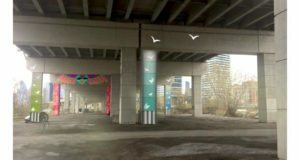 Sponsored by Friends of the Pan Am Path, the area in question is located under the Gardiner at Cherry and by the Martin Goodman Trail and Lower Don Trail. The canvas? The Gardiner’s own infrastructure—those high arches, or “bents” which, while functional, also present provide an apt canvas for Steps’ urban art transformations. In presenting the curatorial theme for the site, Solanki referenced some of the Port Lands area’s ever-changing history as first as marshland, then dumping ground, to the subsequent ecological regeneration and urban restoration that is now in process. Place-making being part of their philosophy, its an ideal location for the Initiative to commence their next street art project. The expectation of this new piece? Not only will it be bright and beguiling but that it will begin the process of reconnecting local elements—of making an area that is “disconnected” and unwelcoming a place you can pass through and engage with on any level. For such an uninspiring location, bold graphic and loud colors were called for, and for this work Steps reached out to two lead artists who shrink from neither: Meera Sethi and Fathima Mohiuddin. It’s a good pairing. Both artists share similar sensibilities in their use of bold lines and strong color, as well as their partiality towards icons that represent spirit—for instance, on both the east and west sides of the Pan Am Path birds will be a strong and recurring emblem. Joining the Lead Artists in the creation of the work will be two emerging artists from Toronto: Stephanie Bellefleur and Daniela Roch. Production starts at the beginning of August with a formal launch taking place in conjunction with Art Spin’s August 24 Port Lands ride. See it in process throughout August. Join them for the launch. Or if you miss these opportunities, there will be plenty of time to enjoy it: this new bold installation will be in situ for five years. To discover more about the Art Spin’s upcoming Port Lands ride go to artspin.ca. 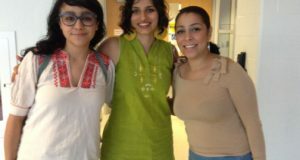 Showing up for the Steps Initative update on the under Gardiner art project on the Pan Am Path: Anjuli Solanki with emerging artists Stephanie Bellefleur, right, and Daniela Roch, left. 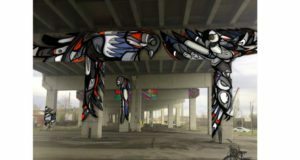 Meera Sethi’s rendering for the west side of the Pan Am Path. The third transformation topic of the evening was the Invictus Games. The Invictus Crew. 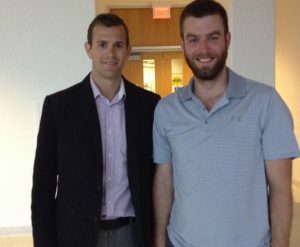 From left to right: Greg Walmsley, Senior Manager Protocol, Security and Venues and Michael Brewer, Chair, Transport, Logistics, and Overlay. Its inclusion in the agenda had a touch of glam (due only to the fact that this exciting event and project of Prince Harry’s was coming to Toronto) but the focus was solidly on its use of local spaces around Mill and Front streets. This celebration of veterans from around the world will run from Sept. 23 to 30. A staggering number of people are involved: 18,000 volunteers, 550 competitors, 17 nations, 300 support staff, twelve sports, 450 media and broadcasters and 1100 friends and family. But as relates to the West Don Lands Committee and their area of interest, the event will also include buses—likely quite a few of them—and (more to the point) a bus staging lot. However functionally humdrum that sounds, and whatever the thoughts were regarding noise, traffic or parking, Greg Walmsley, the city’s senior manager of protocol, security and venues, was not only able to indicate that disruption should be minimal but was also able to make up for it with mention of one exciting asset coming the area’s way. Front and Cherry is the selected location for not only an awards ceremony but also a special Jaguar Land Rover (JLR) competition on Sept. 23. This competition would feature two-person teams from each nation driving Jaguars and then Land Rovers over a fun but challenging route in an “activity zone.” Members of the public would only be allowed to watch on Sept. 23, but from Sept. 24 until Sept. 30 members of the public (at least those holding driving licenses) could get their own shot of driving either a Jaguar or Land Rover over the 2.5 minute route. And lest the kids be forgotten: there would also be a JLR mini-course for them, too.